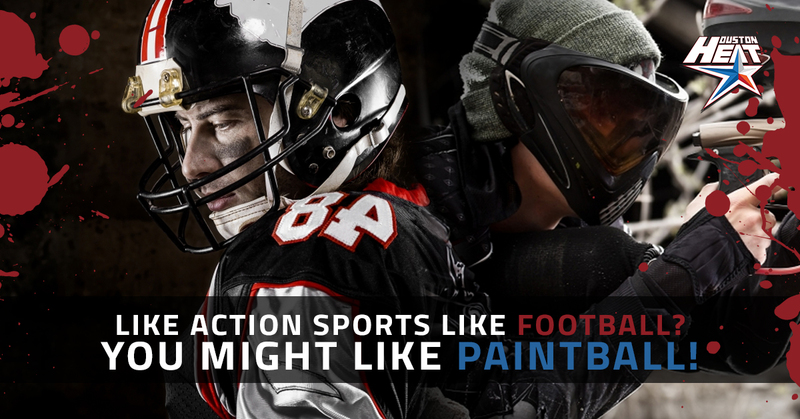 At first thought, football and paintball couldn’t be much different. The size of the players are different, the gear is different, and one has obstacles on the field while the other is completely flat. Paintball, despite its name, doesn’t even use traditional balls as you’d find in football, baseball, soccer, or basketball. As beefy as football players can be, that’s often just the defensive line (and even they sometimes have to sprint like mad). Many of the players have to be able to run fast, leap high, stretch to catch the ball, and be able to run right on the sideline without touching a foot to it. And when the time comes, they might have to do a flip into the endzone. Paintball players have to do a lot of those too. Our players have to contort themselves into a myriad of positions in order to find just the right firing angle. We have to sprint to the next barricade and maybe fly through the air in order to get behind cover. And, like football players, we have to be able to read a situation and respond to it almost immediately. Most every sport has specialized gear, but not every sport has helmets! The design of football helmets has certainly changed over the years, and today’s iconic helmets are a huge part of a team’s marketing. As cool as NFL helmets are, we have to say that ours are even cooler. We’re protecting our whole heads, and in doing so look like something you’d see in a sci-fi movie! And we think that’s pretty awesome. When it comes right down to it, football is a game of land acquisition. And while there was plenty of land acquisition throughout history by having kings marry off their daughters to princes in order to unite kingdoms, football follows the other path…war. Paintball offers the promise of land acquisition, as well, but we’re actually eliminating other players as we do so! Imagine if a football player got tackled and then they were out of the game until the ball switched sides again, forcing the team to change its strategy (hockey already does this for penalties, which really changes up play). While the teams might start off with equal numbers, things change as players get marked. People mock baseball and soccer because they tend to be slower sports. But to tell the truth, football is just as guilty. Sure, there’s action, but it’s in the tiniest bite-sized pieces. It’s like you’re really hungry and are eating a bowl of Cheerios one Cheerio at a time over the course of three hours and twelve minutes! Where did that number come from? Well, somebody ran the numbers and found that the average professional football game lasts 3 hours, 12 minutes. And how much of that is actual action? 11 minutes! Not a very good return on your investment if you ask us. With paintball, you’re going to get a lot more action. Granted, it’s in shorter games, but there aren’t the fouls and out of bounds and commercial breaks that you have to deal with when it comes to football. There you go, a few reasons that these two popular Texan sports are more similar than different. Keep checking Houston Heat events calendar for updates to find out what’s happening next season!